Stop by our location to see what we have in stock today! Amish built Gazebos and Amish built Playsets are added regularly throughout the season. Don't see what you are looking for in our in-stock selection? 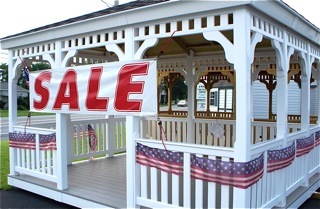 Visit our online shopping pages to custom order your Amish built Gazebo or backyard Playset. 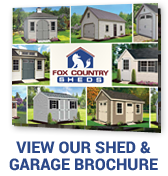 Please note: Prices for our in-stock structures shown on this page include standard assembled delivery within 20 miles of our facility. Contact us for a total delivered price if you are located outside of 20 miles. 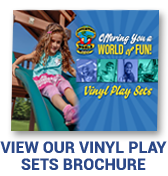 Contact Fox Country Sheds today to provide a quote for your rubber mulch delivery, custom border and site preparation, and vinyl swingset package.